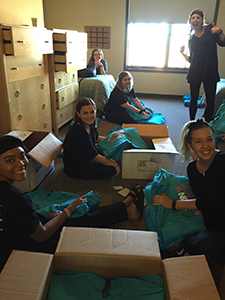 ORU students ready to tackle “Major Cleaning Day” ninja-style with Sacramento Mercy residents. 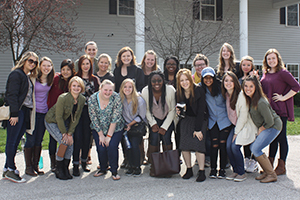 Last week, two teams of female students from Oral Roberts University spent their spring break serving at Mercy’s Sacramento and St. Louis homes. Not only did the teams help out with projects around the homes, but they also enjoyed hanging out with our residents. On Wednesday night of their stay, the students made dinner for the Sacramento residents and decorated the home with a Mexican fiesta theme. Throughout the week, the ORU team helped clean the home and also helped the Mercy staff prepare for the Sacramento Run for Mercy 5K that took place last Saturday. “Helping with the Run for Mercy 5k was awesome! It gave us a very practical way to serve the women that we had become so connected to,” said Christi. 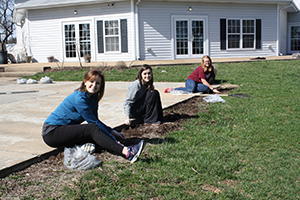 Another team of 11 ORU students served at the St. Louis Mercy home, assisting with many indoor and outdoor projects, such as cataloging library materials and planting flowers. The ORU team also prepared dinner for the residents, played card games, and took time to share their personal testimonies with the girls. One night the students held a “Sort-of Got Talent Show” with the residents and staff that resulted in much laughter and fun. ORU sends out students all over the world on short-term missions trips during students’ spring and summer breaks. The focus of these trips is to be a strategic, short-term investment in the long-term work of the organizations they partner with. 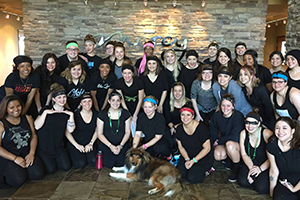 Mercy is grateful for these two teams who gave their time and energy to love and serve our residents. 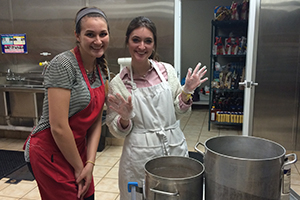 For more information on how you or your organization can partner with Mercy, click here.